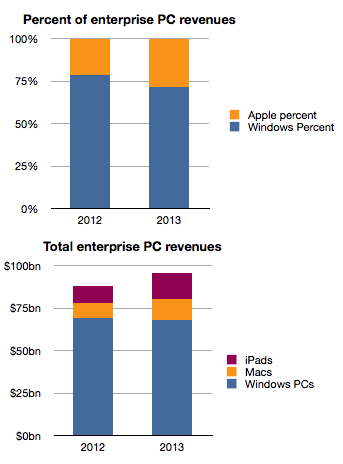 Apple’s share of enterprise revenues doubled from 3.7% to 7.8% in 2010 and nearly doubled again to 14.6% last year. 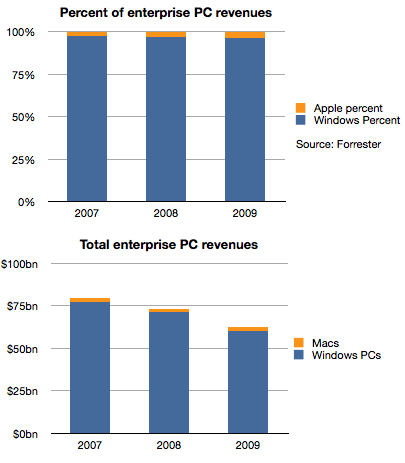 A large part of that acceleration was due to the iPad which generated an estimated 6 billion in sales in 2011, triple what Macs were grossing in 2007. Forrester goes further and estimates the same data for the next two years. The estimate seems to be an extrapolation of the last two years which may or may not happen and we should treat it with caution. However, if the pattern emerges as an extension of the near past, Apple’s position in the market at nearly 30% share next year would be a sea change. It may challenge for the top spot among all vendors to the sector. It’s been said many times that “if only Apple put more emphasis” on Enterprise sales, imagine how much more growth they would obtain. However, I believe that this reversal of fortune did not come about from paying more attention but rather from paying less attention to Enterprise. Enterprise buyers are demanding customers. They have highly specific requirements and ask vendors to conform to multiple layers of dependencies. As a result, enterprise vendors (led by Microsoft) have done all they could to make their software and hardware conformable to these needs. For decades this was the modus operandi and, due to the early adopter nature of businesses in personal computing, the resulting product was passed on to consumers as the “standard”. Consumers accepted it as it was better than having no computers at all. The problem is that customers, especially demanding ones, don’t realize that a new basis of performance might be more beneficial. Apple and mobile devices in general presented this “low-end” alternative not in response to requirements from business but in response to requirements from consumers who had been much more eager in the last decade to adopt new technologies with fewer strings attached. All the security, conformability and legacy issues of the early business adopters turned them into late adopters as technology shifted. So a company focused on an asymmetric market led with new solutions to problems that enterprises did not think they had. Mobility was something few IT managers asked for and was granted begrudgingly to only those “most valuable” who needed it due to cost and security considerations. 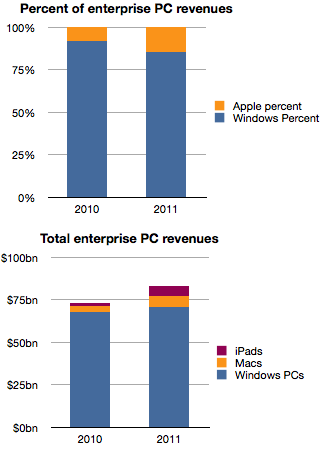 As Apple willfully ignored these Enterprise needs it, paradoxically, created exactly what they needed. It pried entry into the most difficult of markets by not even wanting to enter. In thinking about how this market will evolve, I hear about “consumerization” and cost reduction as benefits and justification of this shift. But fundamentally, what is happening is a classic low end disruption. Enterprises increased their demands beyond what the users in those enterprises could absorb. Instead of ultra-secure, locked-down and immobile computing, users were looking for flexibility, agility and mobility. That’s what Apple was listening to. Apple’s best strategy today would be to persist on this trajectory and listen to the under-served consumer rather than the over-served and over-demanding IT manager.